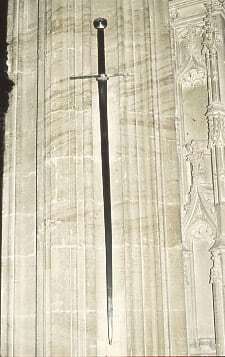 The two-handed sword of Edward III which can be seen in the Chapel hanging in the South Quire Aisle is an impressive reminder of the founder of the College and the Order of the Garter. 6 foot 8 inches long and made to be carried in battle, it formed part of the knightly achievements which would have been offered to the Dean and Canons on his death. The sword hangs by a portrait of the King, carrying it piercing the crowns of Scotland and France. The accounts of 1615 [SGC XV.59.32] read “2s 6d – To Noke, for making cleane the Twoe hande Sworde whiche hangith by K: Edward the 3: picture”. The sword and portrait have clearly been displayed together in the Chapel for almost 400 years.